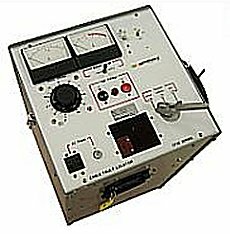 Haefely Hipotronics CF Series test systems for fault locating of primary cables consist of a DC proof tester, a Burner and a Capacitive Discharge Fault Locator (thumper). These self-contained portable units are rugged, reliable and compact making them ideal for field use, The CF30-8 has a continuously adjustable impulse rate from three (3) to thirty (30) seconds. Test ratings are a 30kV DC proof test voltage, a 50mA burn current and a 0 to 15kV DC capacitance discharge (thumper) voltage. The units can be used with high voltage coupler (4100 Series) and a time domain reflectometer (TDR) to quickly provide a specific distance to the fault in feet or meters. This combination of equipment can greatly reduce the amount of high voltage (number of thumps) the cable resulting in reduced damage or degradation to the cable under test. For additional pinpointing the FLASH PHONE (H-FLASH) acoustic detector can be used in conjunction with the C30-8 to pinpoint the exact underground location. While the CF "thumps" the cable the user "listens" to the thumping using the Flash Phone and can pinpoint where to start digging to repair the fault. Haefely Hipotronics has years of experience in cable fault locating the toughest faults. Their line of cable fault locating equipment is designed and manufactured based upon their field expertise. Whether you use the fault locator alone or with other accessories you've got a powerful tool to help restore power to your customers quicker. Self-Contained Features Proof Tester, Burner and thumper. Impulse Energies of up to 900 Joules. Automatic and Manual Thumper mode. Operate from Line Voltage or Generator. Accurate Fault Identification and Location. One Unit for URD Cable Maintenance Testing. User Safety - visual verification of grounding status via face panel window. Variable Impulse Rate from 3 to 30 seconds. Cable Fault Locator 120V AC 50/60Hz supply with only 15 feet of return, HV cable, and MC type connector for use with HVC coupler and 8100 cable rack. Cable Fault Locator 230V AC 50/60Hz supply with only 15 feet of return, HV cable, and MC type connector for use with HVC coupler and 8100 cable rack. One each CF30-8 with terminations, Interlock Plug, Operations Manual, and Calibration Certificate.